Any style is possible with the Proraso Moustache Wax. 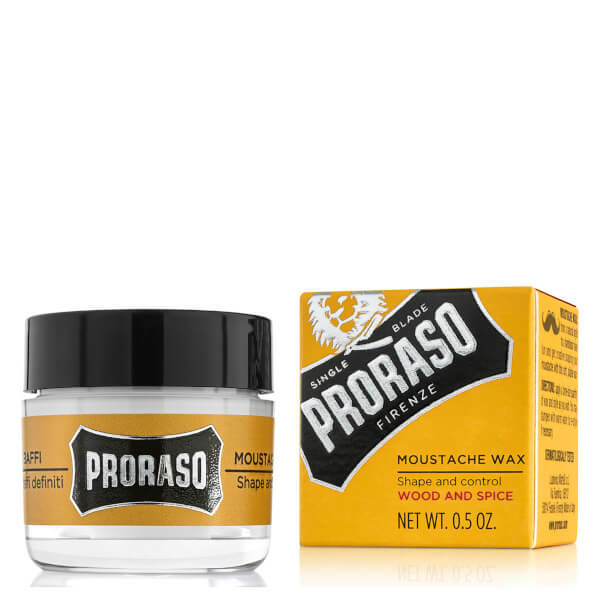 The soft wax is perfect for using to groom or style your moustache, create a soft natural look or a fun handlebar style, whatever style you go for you know that everyone will be jealous of your great ‘tache. The aroma of sandalwood, eucalyptus, meditarranean citrus and caramel will linger on your skin. The perfect way to add a touch of fun to any look. A.B. Apply a small quantity of wax and create the style you desire. To re-style, dampen with warm water. Aqua (Water/Eau), Cera Alba (Beeswax), Sodium Cetearyl Sulfate, Butyro-spermum parkii (Shea) Butter, Xanthan Gum, Soidum Benzoate, Phenoxyethanol, Benzyl Alcohol, Menthol, Eucalpytus globulus Leaf Oil, Parfum (Fragrance), Alpha-Isomethyl Ionone, Coumarin.